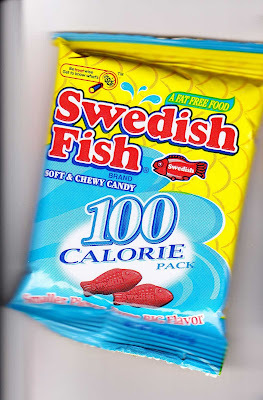 HolyJuan: Swedish Fish 100 Calorie Packs – DON’T BE FOOLED! I am a connoisseur of Swedish Fish. I love them and they love me. I eat them and they melt in my mouth and swim in my belly. The only problem with them is that they come in eight ounce, single serving packs. The bag might suggest that there are five servings inside, but once the bag is opened, it is too hard to avoid the red, succulent sweetness inside and soon the pack is empty. While browsing the candy isle at the grocery store for road trip snacks, I found the solution to my calorie engorging issue… Swedish Fish 100 Calorie Packs. Five one-hundred calorie packs per box! I could eat the sweet fish with a measure of control! I was delighted. Something was wrong. They were not the same. They were slightly gritty. They were not as gummy. They tasted… off. Tears slipped from my eyes and I blamed the glare off the road. You can tell from the photo that the larger fish is less opaque. The smaller fish is foggy. The ingredients on both packs are the same. I think the problem is with scale (fish scale?) The fish are smaller, but the skin thickness is the same if not thicker! 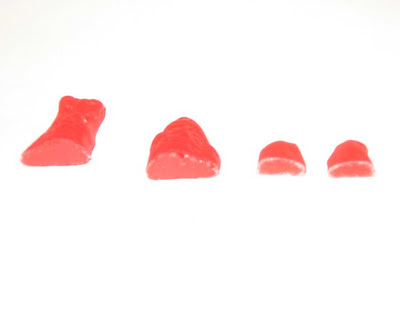 There is less gummy in the middle. It’s just not the same. Stay away from the 100 calorie snack packs. 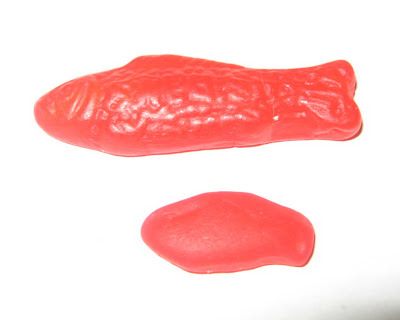 For 100 calories, eat about 5 of the larger fishes. You should totally call the 1-800 on the package and ask them about it. I called CountryTime and asked them where they got their pink lemons from. And I called M&M Mars when they took out the tan M&M and put in the blue one. "Well, we can only have so many colors in the dye machine, and we took a poll. The light brown was the least favorite color." "I see. And what does the NAACP think about eliminating the brown ones to make room for the blue ones?" Dougie. Sweedish Fish is totally a Loughlin thing....I buy them every time I travel...Joe is always looking for the snickers and the milky ways his mom would buy....but since I purchase the food/snacks all he finds on road trips is Sweedish Fish, Starburst, and Lemonheads. By the way, I am so glad you spend so much time on this blog. I love reading it. Did you buy those at the dollar store, juan? No way! I bought them at Krogers and the sell by date was eight months out!